Sell Your Home. Change Your Life. There’s a lot of mistrust in the field of real estate. When some people think of realtors, they think of a necessary evil. An aggressive pitbull of a person that will sell your home for you, not terribly great to be around or easy to confide in, but they'll get the job done. Or the other even less palatable option: Disengaged, hard to reach. Gets the listing contract signed, sticks a sign in the yard, and then sits back and waits around for another agent to bring them a buyer. That person is not us. In fact, what we saw in other real estate brokerages is exactly why we decided to start Montana Good Life Properties. We are radically client-focused. Get results for you in the shortest period of time. How? Stay tuned. Provide you with an authentic, transparent experience. We will be there communicating with you from start to close. We want you to get the highest price possible from your home. The longer it’s on the market, the less it will sell for, that's the reality. We work fast and effectively. We know what works and believe in our rock solid systems -- and we’ll be with you every step of the way. We believe providing a service is providing value -- tools that will help you through the process. Realtors should not be adding more anxiety. Our goal is to be the cold compress relieving the migraine of the selling process. Not all agents (or real estate offices) are created equal. Almost any agent can list a property on the MLS with a bit of training and knowledge, but good pricing and preparation is fundamental to selling it for the highest price in the shortest period of time. We remove anxiety from the transaction and help you, the seller, navigate the process. We believe the longer your home is on the market, the less it will sell for. I know we mentioned that before, but it's worth repeating. (We are pretty transparent, and believe in our systems). We've provided a general overview of our process, so you know what to expect from the get-go. That's right. A competing agent providing compliments. Seems crazy, but it's true. We are a Certified Professional Property Stager. We've been offering staging to our clients since we started selling real estate, and recently added additional tools exclusively for client use to get your home sale ready with the least amount of pain and suffering possible. Gone are the days when an agent would stick a sign in the yard, put the property on the MLS, and wait for offers to roll in. Even in a very active market, we believe your property deserves maximum exposure to potential buyers from the moment we have a signed listing agreement, and we do everything possible to bring the best buyer to your doorstep. This includes our national network of real estate agents as well as our extensive network of local agents, industry resources and vendors. She is knowledegable, tireless, dedicated to the task and ridiculously responsive. Read what more about what our clients are saying about working together. 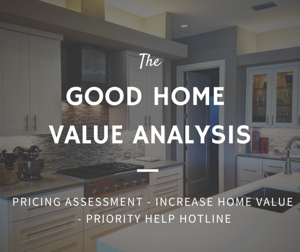 Contact us with your questions or to discuss a free property value analysis. Or just give a call to see if we are a great fit.